God the Son has graciously condescended to reveal the Father to his creatures from without; God the Holy Spirit, by inward communications. Who can compare these separate works of condescension, either of them being beyond our understanding? We can but silently adore the Infinite Love which encompasses us on every side. The Son of God is called the Word, as declaring his glory throughout created nature, and impressing the evidence of it on every part of it. He has given us to read it in his works of goodness, holiness, and wisdom. He is the living and eternal law of truth and perfection, that image of God’s unapproachable attributes, which men have ever seen, by glimpses, on the face of the world, felt that it was sovereign, but knew not whether to say it was a fundamental rule and self-existing destiny, or the offspring and mirror of the divine will. Such has he been from the beginning, graciously sent forth from the Father to reflect his glory upon all things, distinct from him, while mysteriously one with him; and in due time visiting us with an infinitely deeper mercy, when for our redemption he humbled himself to take upon himself that fallen nature which he had originally created after his own image. 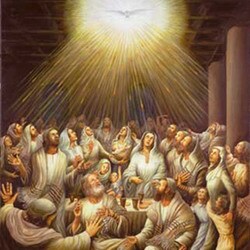 The condescension of the Blessed Spirit is as incomprehensible as that of the Son. He has ever been the secret Presence of God within the creation: a source of life amid the chaos, bringing out into form and order what was at first shapeless and void, and the voice of truth in the hearts of all rational beings, turning them into harmony with the intimations of God’s Law, which were externally made to them. Hence he is especially called the “life-giving” Spirit; being (as it were) the soul of universal nature, the strength of man and beast, the guide of faith, the witness against sin, the inward light of patriarchs and prophets, the grace abiding in the Christian soul, and the Lord and Ruler of the church. Therefore let us ever praise the Father Almighty, who is the first source of all perfection, in and together with his co-equal Son and Spirit, through whose gracious ministrations we have been given to see “what manner of love” it is wherewith the Father has loved us.